CHICAGO (AP) - Patrick Lalime wasn't much better than Ilya Bryzgalov on Wednesday night, just a bit luckier. Lalime made 32 saves for his first shutout in more than a year, and Jason Williams scored the lone goal on a deflection in the first period in the Chicago Blackhawks' 1-0 win over the Phoenix Coyotes. Lalime didn't face as many quality chances as Bryzgalov in posting his first shutout since Feb. 7, 2007, and the 35th of his NHL career. He started his third straight game for Chicago because No. 1 goalie Nikolai Khabibulin remained sidelined due to back spasms. "We know how big the points are right now, and to win is all that matters right now," Lalime said. "The defense let me see the puck and they were taking away the rebounds. It made my job a lot easier." Chicago is 7-2-1 in its last 10 games. However, it entered the game in 13th place in the Western Conference and eight points behind eighth-place Nashville. "To make the playoffs and be a good playoff team you have to step up," Chicago defenseman James Wisniewski said. "You have to win 1-0 games. It's good he (Lalime) stepped up to the challenge." The Blackhawks might have lost forward Martin Havlat indefinitely Wednesday with an apparent shoulder injury. "It's up around the shoulder area," Chicago coach Denis Savard said. "I'm not sure." From the right circle, Williams deflected in Dave Bolland's cross-ice feed. The puck slipped past Bryzgalov after also deflecting off the skate of Phoenix forward Joel Perrault. The goal was Williams' second in four games after he missed 35 due to a groin injury and sports hernia surgery. "It hit a skate," Bryzgalov said. "I think both teams played well, at the same level. They scored a lucky, ugly goal and we didn't. That was the difference." Phoenix entered the game in 10th place in the West, just three points out of eighth. "Both teams are battling for their lives," Coyotes coach Wayne Gretzky said. "They played hard, and one goal is the difference. "When we did get some chances, their goaltender was really good. When they got chances, our guy was good." The Blackhawks had the better chances in the scoreless second. Among Bryzgalov's best saves was one on Patrick Sharp from 15 feet out midway through the period. Lalime made a point-blank stop on Martin Hanzal with a minute left in the second. Early in the third, a shot by Phoenix's Marcel Hossa hit Wisniewski's skate and then tapped against the right post. Lalime made a crisp stick save on Daniel Carcillo's 25-foot shot midway through the third. Bryzgalov stopped Sharp's one-timed shot from the slot with just over six minutes left. Phoenix finished the game with a power play and Bryzgalov on the bench for and extra attacker. The Blackhawks kept the Coyotes at bay, however. "I don't think they even got a shot," Lalime said. "Everybody boxed out and made sure the puck didn't get to the net. Notes: Players acquired by both teams before Tuesday's trade deadline were in the lineups. LW Andrew Ladd, acquired by Chicago from Carolina for C/LW Tuomo Ruutu, played as did Hossa, picked up by Phoenix in a multiplayer deal with the New York Rangers. 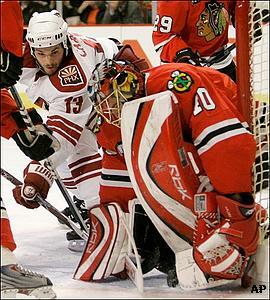 ... With Khabibulin out, Lalime was backed up by Corey Crawford. ... Chicago C Robert Lang sat out due to back spasms. ... Blackhawks D Brent Sopel missed his third game and C Yanic Perreault sat out his sixth, both because of broken wrists. ... Chicago recalled D Petri Kontiola from Rockford (AHL) ... Havlat has already missed 28 games this season with a shoulder injury.